This is the first ever "Surprise-Birthday Party" at Happy Birthday Author. If you have been a reader of the blog for a long time, you know that every once in a while I will throw a "Surprise Party" to introduce you to a new author. I got in touch with Allison Taylor, co-author of The Green Alphabet: A First Look at Ecology last week and found out her birthday was May 2. We frantically worked to put this post together to celebrate her birthday. 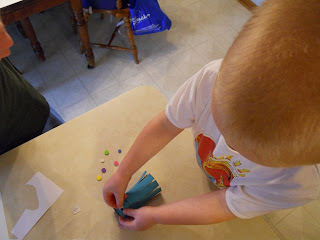 She helped me out by providing a few fun crafty activities for my children which made the celebration so much easier! The Green Alphabet: A First Look at Ecology was developed by Allison Taylor and Donna Hurst, a "retired" commercial artist who currently owns a small decorative painting business. 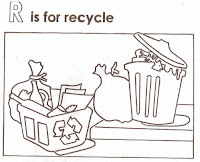 The ABC book presents a wide variety of "green" vocabulary. 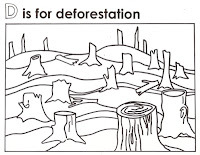 Young readers will recognize words like F is for Forest and M is for Mountains. They will also have the opportunity to learn new words like B is for Biome and O is for Ozone Layer. 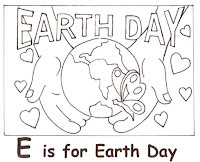 Each vocabulary word is defined in a simple way that will allow a young reader to understand its meaning and how it is connected to "making the world a greener place." 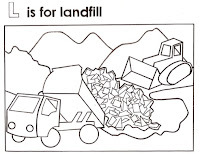 My children enjoyed the illustrations and often used them for assistance when I asked questions like, "What can you compost?" and "What animals live in the jungle?" The best part about this book is that it allowed us to talk about "green" decisions and the positive impact they can have on our world. Happy Birthday Author: Could you tell the readers of Happy Birthday Author a little about yourself? Allison Taylor: I am a Mom of four amazing daughters, and I am fortunate to be able to stay home with them. I have lots of interests; all of which include my family! We love to volunteer whenever we can. Helping people has always been a big part of my life. Before I became a mom, I was a Flight Attendant for Continental Express and Continental Airlines. After leaving the airlines to stay home with my first baby girl, I became an organ transplant flight coordinator (this was a job I did from home 24/7). Since I was a senior in high school, I had the idea for our book, and always dreamt of finding someone who could illustrate it and make it a reality. I met Donna when she taught an amazing Tiny Tots craft class. We became friends, and we both feel strongly about making our world a greener place. 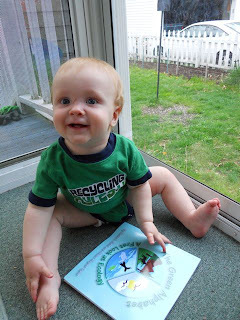 We wanted to educate children about living "green," since it's much easier to form healthy habits when you are young! We worked on our book for almost four years. Happy Birthday Author: Your birthday is May 2nd. Could you share a birthday memory or tradition? Happy Birthday Author: I love listening to the story of how a book gets published. 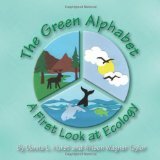 What is the story of The Green Alphabet: A First Look at Ecology? Allison Taylor: Donna and I were anxious to see our book come to life, and we found a publishing company who was willing to publish our book as a joint venture. We were so excited to see our book in print and to share it with the world. We have high hopes of having our book re-published someday! Happy Birthday Author: How difficult was it to fit all your "green ideas" into the format of an ABC Book? Allison Taylor: When the book was originally written by 18-year-old-me, I wrote each word to correspond with the alphabet. At the time, my English teacher was impressed, and she thought it would make a wonderful children's book some day. The terms I used then were not nearly as common as they are today; however, some of the words were redundant, so we wanted to update it, and make it more interesting. Thinking back, two of the most difficult letters were "Q" and "X". Ironically, we decided on those rather quickly! Noise pollution is an issue and we realized everyone benefits from a "Quiet" environment. We always wanted to send the message that "Smoking Stinks," and we saw the letter X as a symbol for "No Smoking." We have some children say the X page is one of their favorite pages! Happy Birthday Author: How did your children react to your published book? Allison Taylor: My children are very proud to have a book in their family! They have been readers since before birth, and they took part in proofreading the book and making suggestions. We like to include them when we do programs - they are very helpful! They were excited to give a copy to their favorite baker...Buddy Valastro from Cake Boss. They also plan to send a copy to Buckingham Palace for the future children of the Duke and Duchess of Cambridge! 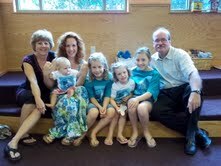 My daughters are also very excited to see our work on Happybirthdayauthor.com. They will be ecstatic to share the website with their classrooms next week! Happy Birthday Author: How does your family "Make our world a greener place"? Any suggestions for families looking to be more "green"? Allison Taylor: We think about our impact on the environment daily, and living "green" is rather simple when you incorporate it into your actions. Back when I was a Flight Attendant, I used to recycle the empty cans from flights before airlines recycled. We recycle and reuse everything we can. We do not use water excessively; turning the water off while shampooing and soaping up saves a lot of water. We also read as much as we can, and we avoid turning on the television excessively. We respect nature and all living things. Things are so much different than when I grew up. I remember riding my bike everywhere. We try to walk as much as we can. We climb stairs more than we ride elevators. We realize how truly fortunate we are to have clean drinking water, and we donate as much of our clothing as we can. Our world has become "disposable" and "convenient". It is sad to me that so many ways our lives are more "convenient" but will have a huge impact on our future. Happy Birthday Author: Are there other projects you are working on? 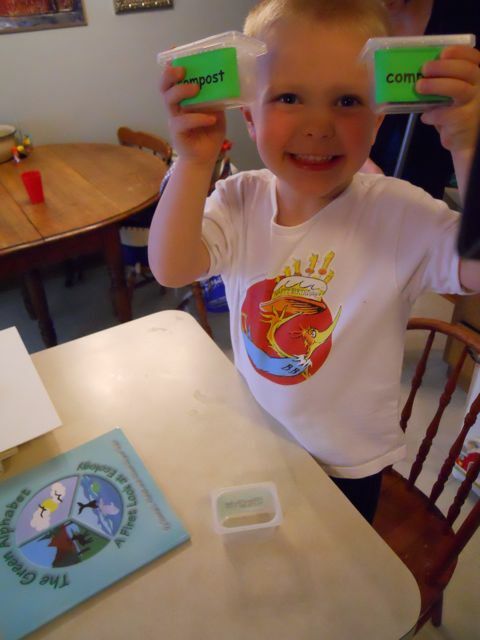 Allison Taylor: For the moment, we enjoy educating groups of children and hearing how excited they get discussing what they know about taking care of our world. We hope to create another book which includes craft ideas and learning tools to supplement The Green Alphabet. 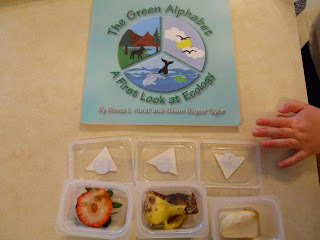 Allison provided baby food containers for us to watch the decomposition of food scraps. "They are going to get all yucky!" She also provided a few toilet paper roll crafts. 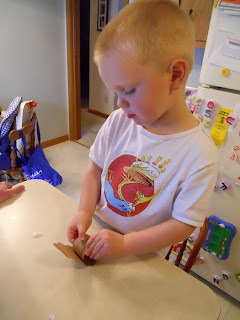 What a great way to reuse materials! This one was a painted blue octopus. My son added eyes and polka dots! 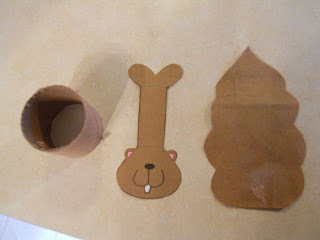 The last craft we did was a toilet paper roll squirrel. Don't forget googily eyes! My son said, "We can help the squirrels by giving them seeds." from a second hand store!